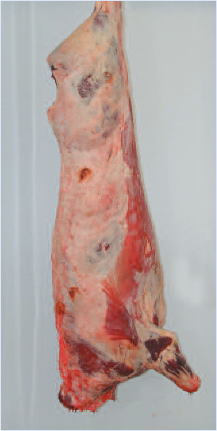 Provided by EBLEX this diagram highlights the good and bad in terms of carcase quality, fat levels and conformation. 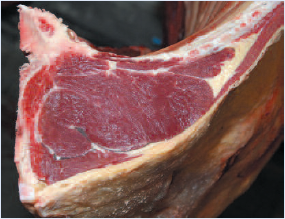 It aims to help producers understand the specifications of the market and to illustrate some of the factors that can effect carcase value and therefore producer returns. Simply hover your mouse over the areas that display an “i” symbol, then you can click to find out more. Very good muscle development with all profiles being convex. The round, shoulder and rump are rounded along with the back being wide and thick. The topside spreads over the pelvis. 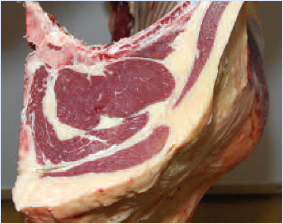 Slight fat cover with flesh visible almost everywhere. Within the thoracic cavity the muscle is clearly visible between the ribs. 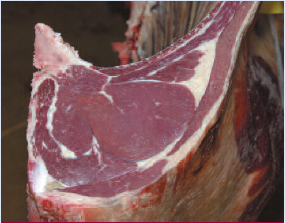 Profiles on the whole mainly straight with good muscle development throughout the carcass. Well-developed round. Thick back, less wide at the shoulder but still neat and fairly well-developed. 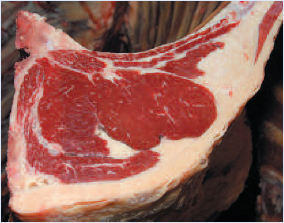 Topside and rump are slightly rounded. 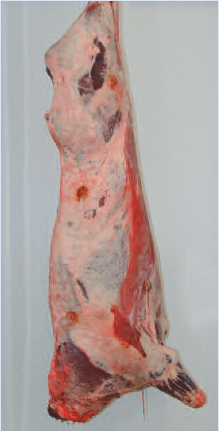 Most areas of flesh covered with fat, but with muscle still visible across the round and shoulder. Some distinctive fat deposits within the thoracic cavity. 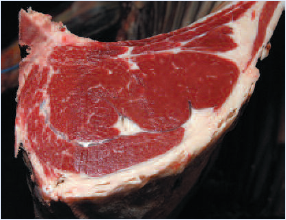 Seam of fat on the round becoming distinctive. 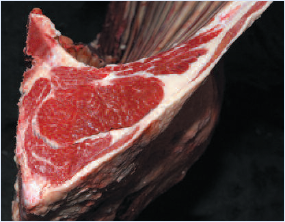 Muscle between the ribs becoming infiltrated with some fat. 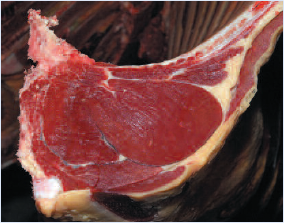 Most areas of flesh covered with a thickening layer of fat, muscle only partially visible across the round and shoulder. Prominent seams of fat on the round. 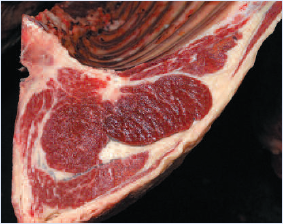 Some distinctive fat deposits in the thoracic cavity and the muscle between the ribs infiltrated with fat. Profiles straight to concave with overall average muscle development. Average to lacking development over the round. Average to lacking thickness on the back. Shoulder flat with a straight profile over the rump. Average fat covering, with the exception of the round and shoulder, everywhere covered with a layer of fat. Slight deposits of fat in the thoracic cavity but with the muscle still visible between the ribs. The odd straight profile but mainly concave. Lacking development over the round. Lacking thickness on the back. Shoulder angular with a straight profile over the rump. All profiles concave to very concave with poor muscle development. Poorly developed over the round, narrow back with bones visible. Shoulder is flat, also with bones visible. All areas of flesh covered with a thick layer of fat. 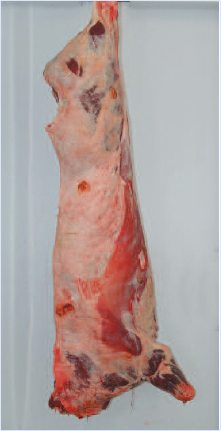 Heavy deposits in the thoracic cavity with muscle between the ribs infiltrated with fat. The round is almost completely covered with fat so that the seams are no longer clearly visible. 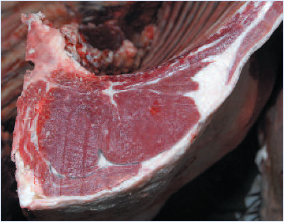 You can find out much more information about carcass quality, the Better Returns Programme and more from EBLEX. And you can download a PDF version of this classification diagram.